At SentiOne, there is a possibility to work in collaboration on online listening projects and customer management. Depending on your SentiOne plan, you can add new users to the app and connect them within teams. For every user or a role, you can set custom permissions that will reflect what they can and what they cannot do while using SentiOne. In this tab, users with the administrator status (i.e. 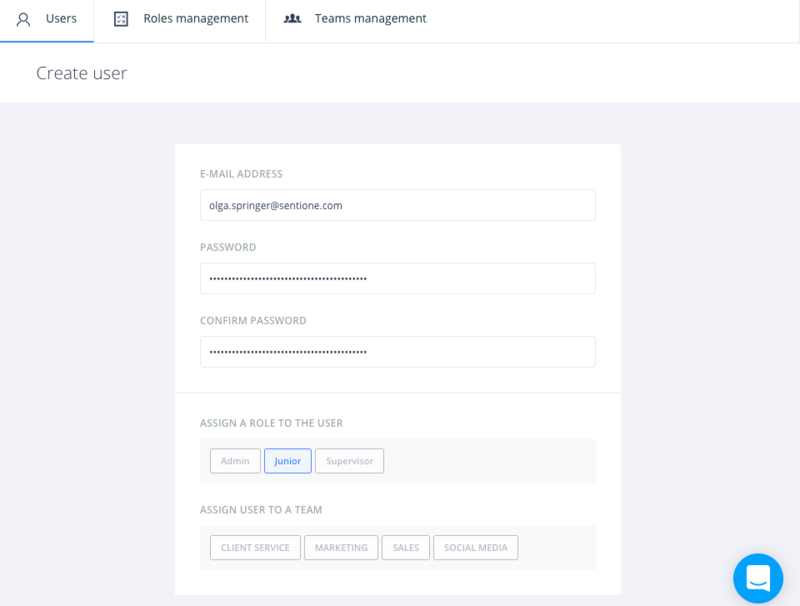 supervisor) can manage users, teams, and roles. Every user can also change their password or switch on the option to log into the SentiOne application via Facebook. After adding the user and setting their permissions, remember to click the “Save” button. Creating teams in SentiOne makes it possible to share work on online conversations between departments. Based on teams, the system can automatically assign selected projects and limit responsibility of managing specific social profiles or markets. To set up proper team configuration and advanced routing table on the account, it is very important to understand how company and specific departments work first and what they are responsible for. Don’t worry - we will help you! We can set up teams, projects and assignments for you as per your knowledge, requirements, and internal processes. Thanks to properly defined roles, you don’t have to set up individual permissions everytime a new user is added to the system. It is possible to simply assign a role to the user and they will automatically inherit particular permissions.